Riverside Casino & Golf Resort is located in Riverside, Iowa, about 12 miles south of Iowa City. Probably the best thing about it for RVers is that it has no policy on overnight camping in its parking lot. Sash and I parked our toy hauler there for 16 nights, and wasn’t bothered by casino security at all. The casino has an RV/Truck parking section at the far-east side of the lot, and there appears to be about 12 extra-long spaces. There are several trucks that park here overnight, and some of them do run their engines all night. There was always at least one other RV besides ourselves that was there. When Sash and I arrived, we did not notify the casino about camping in their parking lot. We simply just pulled our trailer into it and stayed there. 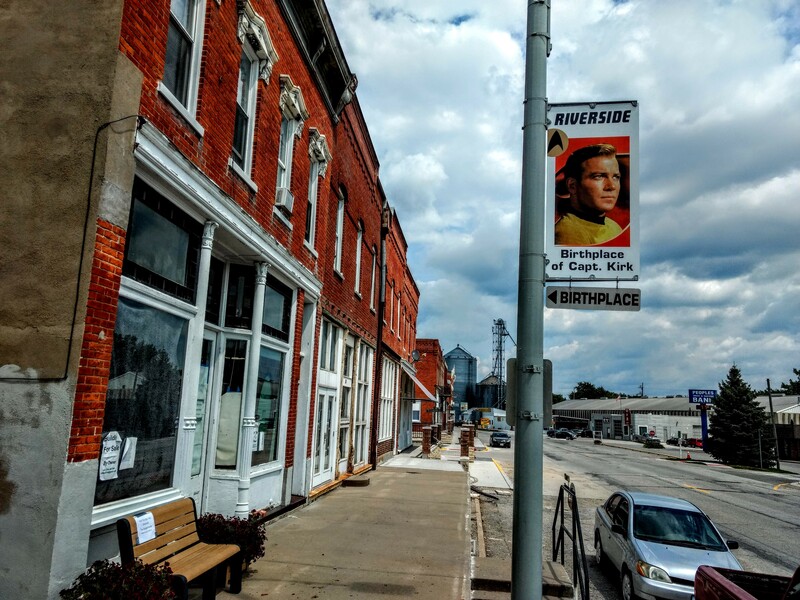 The Town of Riverside has Star Trek banners hanging from its street lights. Was Capt. 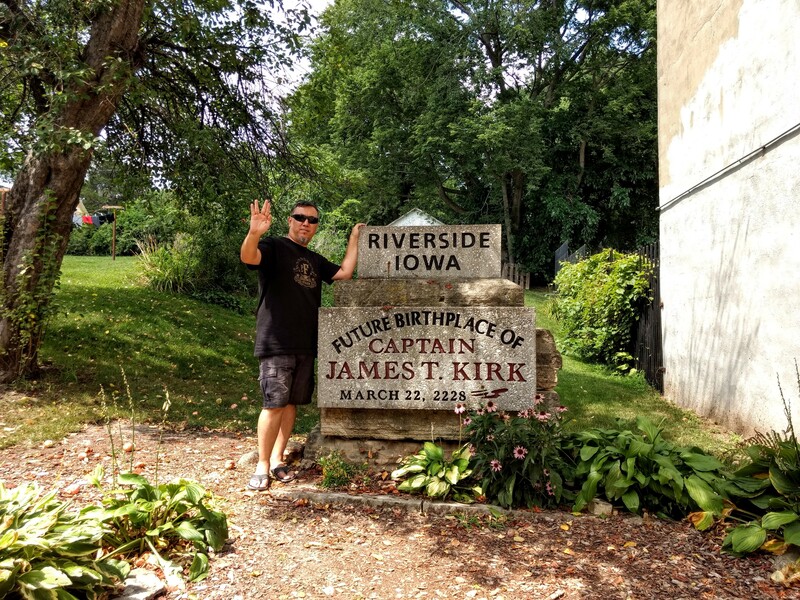 Kirk actually born on this exact location? 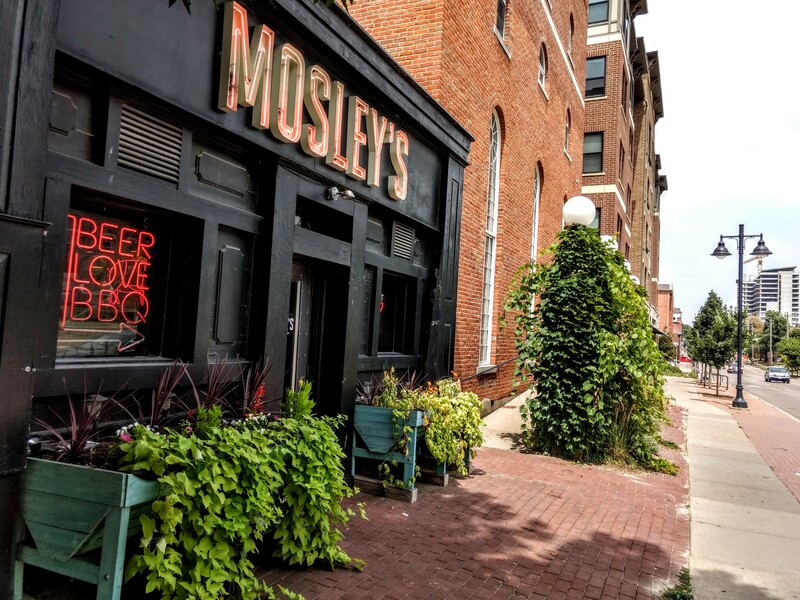 Mosley’s is said to have the best BBQ in all of Iowa City. The closest RV dump station with fresh water refill is at City of Kalona Campground, about 12 miles away. One of the unwritten rules about casino camping is that you always go into the casino and get yourself a player’s club card. Even though we never gambled a penny, we did eat at their buffet and sports bar numerous times. Sash even got herself a massage and facial there, and we bought concert tickets there to see 3 Doors Down and Collective Soul (Sash loves the latter band and it was a coincidence that they were playing while we were there). The nice thing about Riverside Casino is that they let you accrue points on dining, hence having that players club card allows to prove to casino security that we were spending money on their facility like good little campers. There’s lots of grass areas around the parking lot, making it a great place to walk our dog. So probably the big burning question is, “Why did we camp at a casino for 16 straight nights, instead of finding something more wilderness-like?” The short answer is that there aren’t many options in this part of the country. 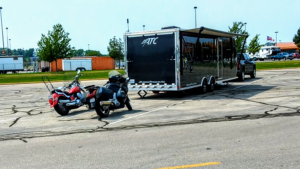 We were here because it was close to our final destination, the ATC Toy Hauler Rally in Bremen, IN, and we had 16 days to kill to get there. There isn’t any free camping I could find in Illinois or Indiana, and very little free camping options in this part of Iowa, either. And since Riverside Casino ended up being a nice place, we just stayed there until it was time to head to the rally. The casino itself is your typical Vegas-style variety, very much like those you’d find on Indian reservations, except Riverside is not tribal-owned. The State of Iowa seems to have some kind of law allowing non-tribal entities to own and operate full blown casinos. Otherwise, the buffet is awesome. Interestingly, the casino offers seniors a $4.99 breakfast buffet on Monday and Wednesday mornings, and they consider anyone 50+ years of age to be a senior. That worked out OK for Sash and I since we are currently 52. Although, it’s also sad to know that we’re actually “seniors”. The Town of Riverside is pretty small, and seemingly somewhat desolate. There’s maybe only 300 people in it. However, they are really big on their Star Trek. 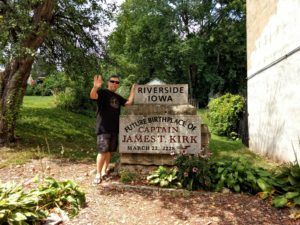 Riverside, Iowa is the fictional birthplace of Captain James T. Kirk, who apparently entered this world there in 2228. There’s actually a marker behind a shop that commemorates his birth. 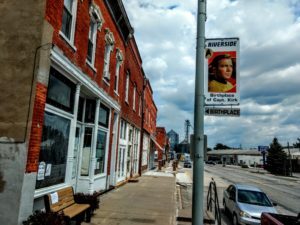 The town has Star Trek banners hanging from its street lights, it has a Star Trek museum, and hosts an annual Star Trek Celebration. About 12 miles to the north is Iowa City, a huge college town. Lots of bars, restaurants, and night-life there if you want proper, city amenities. 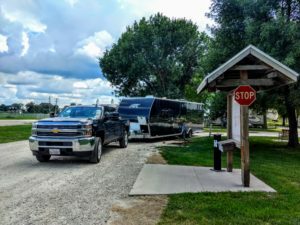 While the casino does not offer hookups of any kind, there is a dump station and fresh water fill about 12 miles to the west at City of Kalona Campground. It costs $10.00 to use. Sash and I ended up dumping and refilling there. There are no grocery stores in Riverside, though it has a few gas station convenience stores. TIP: The casino offers a swimming pool and spa that is normally open for hotel guests only. It is located in the back of the casino. However, you can walk around the back of the casino and find a outdoor patio with a gate. The gate is not locked, and you can access the pool from there. We used the spa a few times. Just be respectful, obviously.